My Book Debut! Pretty Hands & Sweet Feet and a GIVEAWAY! For over a year now, I've been keeping a fantastic little secret from you guys...I wrote a book! Actually, I co-wrote a book alongside 3 other fantastic bloggers you're probably familiar with, and now, it's for sale! 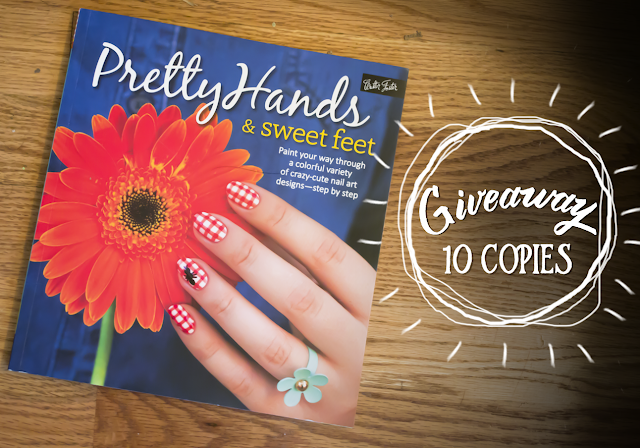 The book is called Pretty Hands & Sweet Feet, and it's a step-by-step nail art book with 25 fantastic nail tutorials you can easily try yourself. There are designs for everyone, from beginner to pro, and we've included the tools and tips to get you through it all. Our designs were even translated into fun pedicure looks so you can match your look from head to toe. If getting published wasn't thrilling enough, I'm honored to have my name alongside the other authors of this book - Sarah Waite from Chalkboard Nails, Samantha Tremlin from The Nailasaurus, and Lindsey Williamson from Wondrously Polished. I know I personally was a little toe-shy on camera, so it's fantastic to see a brave soul, Penelope Yee, translate our designs into pedicure art. It's truly fantastic! Pretty Hands & Sweet Feet is available wherever books are sold, but here are a few easy online resources for you to check out. Here's the really exciting news...I'm holding a giveaway for 10 copies of the book, open to everyone, everywhere! All you need to do to enter to win 1 copy is fill out the information in the giveaway entry below. You can win bonus entries by doing things like follow me on Instagram, but that's not a requirement. I just want to get this fantastic nail art book into as many hands as possible, so enter and share with your friends. It makes a great gift for the holiday season. Sally...you'll want to enter via the Gleam giveaway at the bottom of this post. Unfortunately, any comments on this post won't be counted.